Sometimes the fates conspire, preventing an artist from recording the role for which he is his generation’s touchstone. 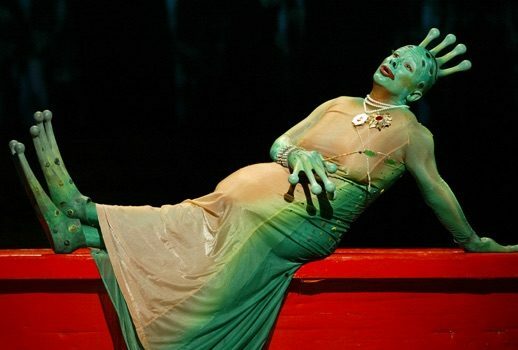 Today “Trove Thursday” rights one of those unfortunate oversights for Jean-Paul Fouchécourt on his 60th birthday with a broadcast of his irresistibly self-absorbed sea-nymph in Rameau’s Platée which also features a dazzling star-turn by Mireille Delunsch as La Folie. Although Gilles Ragon and Paul Agnew are very fine in the title role on the CD and DVD respectively of Platéeconducted by Marc Minkowski, Fouchécourt here brings a delicious amalgam of winsome innocence and spirited truculence to the opera’s over-eager anti-heroine. He’s rather different from the more ethereal Platée of his great predecessor, the recently deceased Michel Sénéchal, who did get to record his classic portrayal. The EMI-Sénéchal version conducted by Hans Rosbaud stemed the famed 1956 Aix-en-Provence production which with the lavish Les Indes Galantes done around the same time in Paris did much to restore Rameau’s reputation in the mid-20thcentury. Revolving around an ugly (female, by the way, though sung by a tenor) amphibious flirt tricked by the gods into a mock-wedding with Jupiter, Platée had a notorious 1745 premiere at Versailles during the celebrations for the marriage of the Dauphin whose bride was not, shall we say, famous for her good looks. This shocking “coincidence” was apparently not commented upon at the time—at least in print—but the opera was not performed again until four years later. The first Rameau work to be revived in the 20thcentury—in 1901 in Munich—it has become his most popular andmost accessible opera. Fouchécourt, who first sang the work in 1990 with Minkowski was the centerpiece for two of the most acclaimed Platée productions of the past quarter-century. I believe he was the sole tenor to perform the title role in Mark Morris’s delirious production first seen at the 1997 Edinburgh Festival. Happily, it was mounted twice by the New York City Opera where I saw it in both 2000 and 2004. Laurent Pelly’s Paris version which premiered with Fouchécourt in 1999 continues to be revived at the Palais Garnier and also traveled to the US in 2007 when Fouchécourt performed in it at the Santa Fe Opera. Like many others, my first acquaintance with the diminutive French tenor was in Lully’s Atys, first on the Harmonia Mundi recording by Les Arts Florissants and then scampering about in three roles in the opera’s legendary production by Jean-Marie Villégier which visited the Brooklyn Academy of Music in 1989 and 1992. He reappeared at BAM with LAF in Rameau’s Les Indes Galantes and then, less successfully, in the title role of the same composer’s Zoroastre. Fouchécourt’s small, piquant haute-contre perhaps wasn’t as suited for that opera’s hero nor was it quite right for Hippolyte in the Minkowski recording of Hippolyte et Aricie. He is, however, a persuasive sculptor in the now hard-to-find Hervé Niquet CD of Pygmalion. I saw Fouchécourt several times at the Met as well but I was surprised to learn that he had sung there so often—over 50 times from 1998-2008 in the supporting roles one might expect such as the four Hoffmann servants, Guillot in Manon, and Monsieur Triquet in Eugene Onegin. Platée was his rare chance worldwide to take center-stage although occasionally other character tenors have been awarded starring roles: my very first Platée was Douglas Perry (opposite the La Folie of a pre-Met Renée Fleming) at BAM in 1988; eight years earlier he had been Gandhi in Philip Glass’s Sataygrahaat its world premiere in Rotterdam. While Fouchécourt sadly doesn’t appear in the video of the Pelly production, he did record several excerpts from Platée as part of his CD of airs associated with Rameau’s favorite haute-contre Pierre de Jélyotte. He has collaborated several other times with the Washington, DC-based Opera Lafayette including a recording and staging of Rebel & Francoeur’s Zélindor which I enjoyed at the Rose Theater in 2007. Platée can be downloaded by clicking on the icon of a square with an arrow pointing downward on the audio player and the resulting mp3 files will appear in your download directory. Another Fouchécourt-Minkowski collaboration in Offenbach’s Les Contes d’Hoffmann can be heard via a previous “Trove Thursday” offering. or via any RSS reader.